Add buttermilk, stirring briefly with a fork until combined. Roll or pat dough about 3/4 to 1-inch thick. Using a 2-inch round cutter, cut biscuits – do not twist – cutting straight down, dipping cutter into flour each time. Re-roll remaining dough for extra biscuits. Place biscuits on baking sheet, well spaced, and brush tops with milk or buttermilk. Bake for 10-12 minutes until tops are golden. Serve right away. 59 Comments on "Buttermilk Biscuits"
I’m putting them in the oven now, I hope it doesn’t affect the outcome of the biscuits. My daughter took veggie oil salt basil and rubbed the loaves generously. I wonder if one could brush quick breads with salt and egg white or butter whatever one uses to finish them before baking? Would a salty spread make up for it ? I’ve made these biscuits 2 times now. They are so delicious. I have been playing with the salt content as I like my biscuits a little more salty. I do not have a biscuit cutter so I used a clear plastic cap from an old bottle of laundry detergent (yes I scrubbed it good). They turn out perfect. Love this recipe. Thank you Jenny! Long time fan of yours. These turned out great. Very successful. Tanka’s, I love watching your YouTube videos and have made several of your recipes. If I make them in the morning..how can I save them for dinner the same day? or the next? Do they have to be frozen right away or can I have them for a couple of days? I spend a Great deal of time in the kitchen.. and there is Always something new to learn, which is why I love Jenny’s channel. With biscuits, I find that if I put them in a plastic bag (zippered style, but leave it open).. and heat for about 20 seconds or so.. depending on desired heat preference, it seems to bring them back to life nicely. Not sure if it’s because the bag might help to retain moisture, but it works for me. I couldn’t print the recipe. I love it because it’s only 2.5 grams of fat, not 10. Please see the FAQs about printing. Hi Jennny, my scones didn’t rise, any tips, I used almond milk btw. Thank you for all your wonderful recipes and your you tube videos! I had kefir on hand so i substituted that for buttermilk and the biscuits turned out great. most charming, which doesn’t spoil the presentation. I am looking forward to watch more of your programs. I live far away from the US and I just absolutely love buttermilk biscuits. But all other recipes got me cringe with the vast amount of butter in them. I was looking all over the place for a less butter recipe but no luck finding one. Until I stumbled upon your video on YouTube. I was a bit sceptical because I happened to make very good, flaky and flavorful biscuit yet I was afraid to eat them. So I tried your recipe yesterday, and promised myself to call you my goddess if this recipe a success. And it was! Same flaky, buttery, couldn’t stop eating just 1! So, now you’re officially my goddess! Thank you so much for the recipe, and I will be an avid maker on your other recipes. Try James Beard’s chef’s recipe, Preheat oven to 450 degrees, 2 c flour (can use cake flour) 1 teasp. salt 4 teasp. baking powder, about 1 1/2 cups heavy cream. Have all very cold, stir cream into dry ingredients with a fork to make biscuit dough, you may need to use a little more or less. just pat together into a 3/4 inch circle(keep dough cold) On floured surface use sharp biscuit cutter dipped each time in flour to cut biscuits straight down, do not twist.Put on parchment lined cookie sheet and bake 12-15 mins.till golden brown. For cheese biscuits add 1 cup shredded sharp cheddar to flour, toss then add cream. May have to bake a minute or two longer. What a lot of fun! My husband and I could not stop watching your how to videos. Your simple, no-fuss approach is exactly what we are looking for. We will be starting with the no knead bread recipe and then moving onto the buttermilk biscuit recipe. Thank you for making us want to bake again. You are a delight and we will revisit your website whenever we are looking for a recipe. Thank you so much Jenny. I love your recipes! I was wondering how much sugar I should add to turn these lovelies into sweet strawberry scones? I did not have buttermilk and what I did was to substitute buttermilk with 2% milk. I used 1 cup of milk and 1 stick of butter instead. The biscuits turn out flaky. Actually, butter and milk isn’t buttermilk. Buttermilk is a mix of milk and lemon juice/vinegar. Buttermilk is produced from cow’s milk combined with lactic acid bacteria, which creates the sour taste. Some people wanting a substitute for buttermilk use a combination of milk with lemon juice or vinegar. For How many days we can preserve these biscuits ? I have only made biscuits the traditional way, which is to cut the butter into the flour using a pastry cutter or two knives and the result is excellent, but you can find recipes online that use an electric mixer. 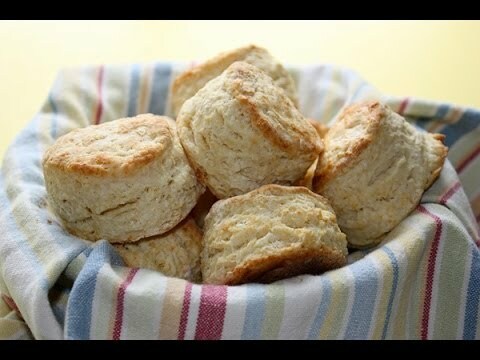 Great biscuits and easy to make. The best of all is no shortening added. I use 3/4 of whole wheat pastry flour to blend in 1 cup all purpose….my boy like it plain. For guests and rest of the family members I add 1 tsp garlic powder, 1/2 tsp paprika, 1/2 tsp dried pasley, and 1~1 1/4 cups Mexican blend cheese for breakfast quick bread…… Use a 1/4 measuring cup to lightly pack the dough and transfer to a baking sheet, gently press down to 1-inch thickness and bake at 450°F for 14 minutes or until golden brown on top. make 12 yummy biscuits. Can i use or mix whip cream instead of buttermilk? You can use whipping cream to make buttermilk. 1 cup cream, 4 teaspoons distilled vinegar. Let sit at least 15 minutes to react. You can go to the baking isle of the store and by powered buttermilk blend. Use what you need per instructions and never have to worry the regular buttermilk will spoil before you use it all. I buy mine at Wal Mart. I don’t know if the name is Saco but it is a red, white and orange container with a chef on the front. That’a a great suggestion, thank you. I’m only 11 and my mom won’t drive me to the store to get buttermilk and I looked at your website and I only see a substitute for one cup of butter milk but I need 3/4 cup butter milk because that’s what it says in your recipe. So do I put 1 tablespoon of white distilled vinegar then fill it up to one cup THEN measure 3/4 of a cup of buttermilk from the mixture with one cup of milk and 1 tablespoon of vinegar. Sorry for asking so many questions, I’m FINALLY going to make your cinnamon roll recipe I’ve been wanting to do that for so long. I LOVE BAKING !!!!! I love baking too! You can do this two ways: 1) Measure one cup of milk, add one tablespoon of vinegar and after you let it stand, stir it up and pour off 1/4 cup to keep for later. That will leave you 3/4 cup to use. 2) Measure 3/4 cup of milk and add 2 1/2 teaspoons of vinegar, which is pretty close to 3/4 of a tablespoon. Good luck. Let me know how the biscuits turn out. I still prefer baking with real buttermilk so I hope you can get some next time your mom goes to the store. Above you said you can freeze the biscuts. Are they formed and frozen before they are baked or after baking? I freeze mine after baking but you can also freeze them before baking. Frozen biscuits can go right from the freezer into the oven. I love your receipts and videos. On the biscuits once frozen how long is the cooking time. Baking time should be the same, maybe a minute or two longer. Hi, i didn’t use butter milk before, isn’t safety for baking? I have goggle many comments say 1 tbsp vinegar or lemon juice+ 1 cup milk, any kind of milk can? Or glucose work? I live outside the USA right now and cannot get buttermilk. What would work best for this recipe? Also I want to make about 60 of these and freeze them 2 days before baking them. Any suggestions? Your recipes are great, and so glad I can make some traditional Polish food for my kids just like my Grandma used too. There is no perfect substitute for buttermilk because it’s the acid in buttermilk that makes biscuits light and tender. You can try combining yogurt with milk until it’s the same consistency of buttermilk. Use about 1/3 part yogurt to 2/3 part milk. Some say you can add 1 tablespoon of lemon juice or vinegar to 1 cup of milk and let it stand for 5 minutes to mimic buttermilk but to me it does not quite measure up. As for freezing you can freeze biscuits to bake later. Once they are cut, place them on a sheet in the freezer and once frozen, place them in an air-tight freezer bag. You can bake them while still frozen but you may have to bake a minute or two longer. Hi i made this recipe and the biscuits were wonderful but when we started eating them they felt like they had dirt in them any suggestions what i did wrong ? Sometimes biscuits develop tiny brown spots on the top and that might be what you’re tasting. These brown spots are usually caused by over-working the dough so make sure to knead it gently by hand only 8 or 10 turns. The less that biscuit dough is handled, the better. If it’s not the brown spots, I can’t imagine what would cause a grainy texture. There’s no ingredient I can think of that can create that. Be sure to start by sifting the dry ingredients together so they are well incorporated. Stir & knead the dough gently. If you have made no changes or substitutions and are following the recipe exactly, this really should not happen. Keep me posted. You can make a buttermilk substitute for each cup of milk, remove one tablespoon and replace that tablespoon of milk with 1 Tablespoon white vinegar or lemon juice. For less than a cup then you would have to adjust that. Dear Jenny I made the buttermilk biscuits and found them dry when I make them again I will add a little more butter thanks. Just made these and they taste great! May I use very cold coconut oil in place of the butter? In order to use regular milk instead of buttermilk, what should I add/omit? Love love love your recipes,website,you tube channel!! I am a big fan of buttermilk for baking for the light & tender results you get. I’m not sure you would get the same using milk but I see recipes online that do use milk…. and some that use coconut oil but I’m sorry I’m not able to tell you how to change my recipe quite that much. You could try just making those 2 substitutions with my recipe but you may have better luck looking for a different recipe that was created specifically for milk and coconut oil. I am going to use your biscuit recipe for Easter, *fingers crossed* wish me luck!